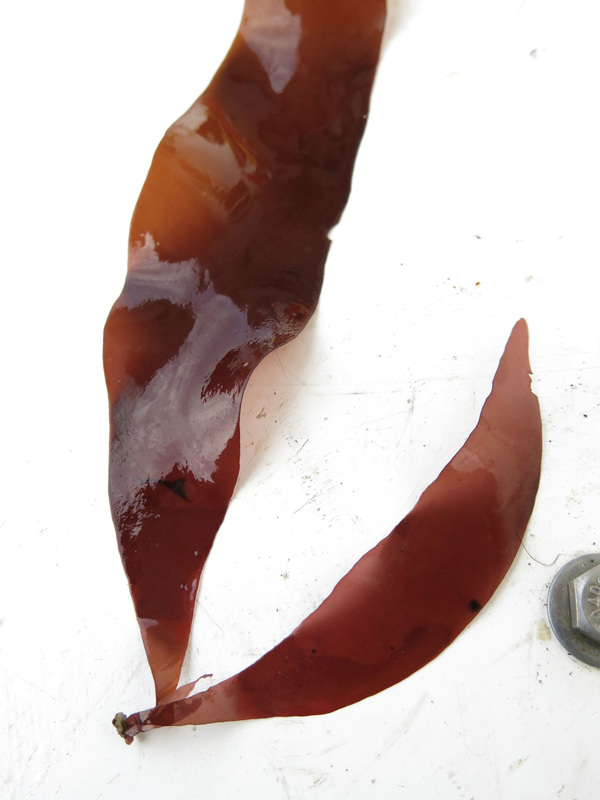 *literal translation = "red ribboned kelp"
This red seaweed has a leathery texture, with fairly shiny and thick dark red or reddish-brown blades. The blades reach 20 cm long, are strap-shaped (ligulate), and either unbranched or divided into 2 or 3 lobes with rounded tips. The bases of the blades are tapered into a disc-shaped holdfast. Stiff red ribbon attaches to rock in the mid to low intertidal, and tends to form substantial fringes. It is found in semi-exposed habitats from the Aleutian Islands in Alaska to northern California; it is a common species in Alaska, but south from there it is infrequent and only found in locations on isolated outer coasts. It is also found along the coast of Russia. Red ribbon (Palmaria mollis) is thinner, shaped more like a glove, and has less rounded blade tips. It is usually found below stiff red ribbon in the intertidal. This species is edible. It pops like popcorn when dried, cut into small pieces, and fried in hot oil. Lindberg, M. and Lindstrom, S. (2010). Palmaria hecatensis Stiff Red Ribbon. Seaweeds of Alaska. Accessed 06/06/2016. O'Clair, R. and Lindstrom, S. Palmaria hecatensis M. W. Hawkes. In Klinkenberg, Brian. (Ed.). E-Flora BC: Electronic Atlas of the Plants of British Columbia. Lab for Advanced Spatial Analysis, Department of Geography, University of British Columbia, Vancouver. Accessed 06/06/2016.